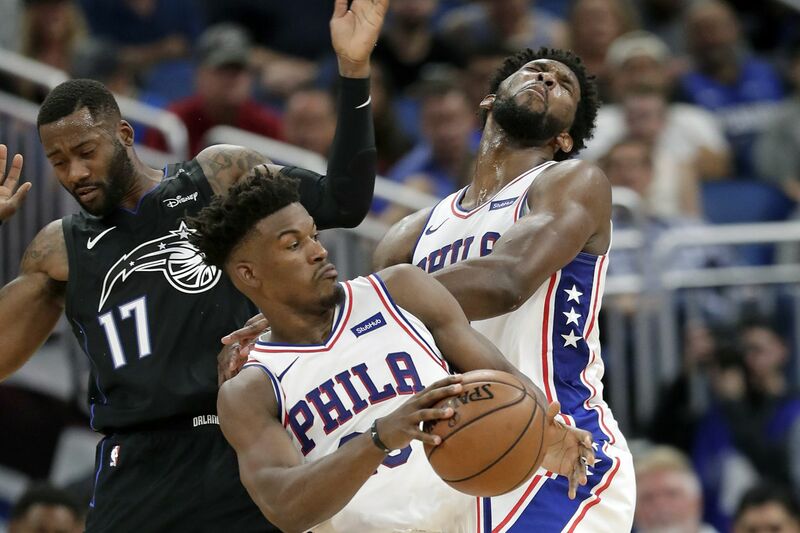 Jimmy Butler, center, collides with teammate Joel Embiid, right, as he tries to get around the Magic's Jonathon Simmons during the second half. NEW YORK – The 76ers just might be the NBA’s most talented, issue-riddled team. The 27-16 squad takes the Eastern Conference’s fourth-best record into Sunday’s game against the New York Knicks at Madison Square Garden. The Sixers have two NBA All-Stars in Joel Embiid and Jimmy Butler and the 2017-18 rookie of the year in Ben Simmons. Yet, two of those guys – Embiid and Simmons – have fought for rebounds on multiple occasions. The defensive scheme either doesn’t work or players just aren’t buying into it. And the team has been hard-pressed to go a few weeks without some type of drama. Added to that, Simmons didn’t hold back following the team’s latest loss, Friday’s 123-121 defeat to the lowly Atlanta Hawks at the Wells Fargo Center. “I think we were too soft,” he said. Butler wouldn’t co-sign on Simmons’ declaration. Butler said his team was beaten in every aspect of the game. The young Hawks (13-29), without injured starters Kent Bazemore and Taurean Prince, did what they wanted to do in a game in which Embiid was sidelined with a sore right ankle. And, as Butler acknowledged, Atlanta did that for 48 minutes. It marked the second straight bad loss for a squad with high expectations. On Wednesday, they suffered a 123-106 road loss to the 18-25 Washington Wizards. At the time, the thought was the Sixers took the Wizards squad lightly due to pounding them, 132-115, a day earlier in Philly. But these losses could be the start of a disastrous stretch. Sunday’s game against the Knicks (10-32) is no longer considered a guaranteed victory,especially with Butler and Embiid being listed as questionable. Butler is dealing with a rib contusion, while Embiid is dealing with his ankle. The Sixers may also have a tough time against the 20-22 Minnesota Timberwolves – Butler’s former team – at home Tuesday. And good luck during the following 12 games against mostly elite teams. But after Friday’s loss, Butler was asked about the atmosphere in the locker room. The Sixers have 39 games remaining in the regular season. As Butler pointed out, that’s plenty of time to get things together. Last season, they were 22-21 at this point. But Marco Belinelli and Ersan Ilyasova, two sharpshooters the team has been unable to replace, turned that season around. The Sixers signed both of them to free-agent deals after their contract were bought out by the Hawks. The Sixers were three games above .500 (28-25) before Belinelli signed on Feb. 12. On Feb. 28, Ilyasova rejoined a Sixers squad that was 32-27 with 23 games remaining. The team went 20-3 down the stretch, including setting an NBA record with 16 straight victories to conclude the regular season. The 52-30 record was the team’s best mark since going 56-26 in 2000-01. The Sixers, who have an open roster spot, are in the market for a perimeter defender and a post player before the Feb. 7 trade deadline and/or the buyout market. Yet the Sixers have issues, from the unavailability of Markelle Fultz and Zhaire Smith, to the team’s chemistry issues and defensive shortcomings. The season’s new defensive strategy is for Embiid to protect the rim on most occasions. It’s up to his teammates to guard the opposing team’s center when he leaves the paint. But that doesn’t always work in a middle pick-and-roll defense against big men who can shoot from the outside. The Sixers also are more often than not a victim when switching on defense instead of fighting through screens. That has led to opponents seeking out preferred mismatches off switches. But on Friday, the defense provided very little resistance no matter what. The Hawks, liker Butler said, did whatever they wanted from start to finish. Brown also has to find a way for Butler, Simmons, and Embiid to co-exist better on the floor. The team had lofty expectations after acquiring Butler in a blockbuster trade from the Timberwolves in November. But since then, he and Embiid have both voiced their displeasure with how they’re being used. The problem is that Simmons is not a shooter, while Butler is a scorer. They’re both more effective with the ball in their hands. Embiid also needs the ball as a towering post presence. While the team tried to downplay it, Embiid was noticeably frustrated when it happened on Jan. 1 against the Los Angeles Clippers at the Staples Center. Embiid grabbed a rebound early in the third quarter. Simmons, who was also going for the rebound, inadvertently elbowed Embiid in the face. The center fell to the ground and was noticeably heated while walking to the bench. He yelled something about a rebound. But at least those two are playing. The same can’t be said about the team’s top picks in each of the last two drafts. Fultz, the first overall pick in 2017, is still in Los Angeles where he’s spent most of his time after his agent, Raymond Brothers, announced on Dec. 4 that his client was diagnosed with thoracic outlet syndrome. The condition was supposed to sideline him up to six weeks. Six week from Dec. 4 will be Tuesday. But the Sixers give the impression that they don’t know when Fultz is going to return to the court. Smith has been working out with a shooting coach at the team’s practice facility. However, he has yet to play a game this season, first because he fractured his foot and then because of a severe allergic reaction to food. Despite the chaos, the Sixers still have their best record through 43 games since going 33-10 during the 2000-01 campaign. But their expectations will take a hit unless things change, especially on defense. “We know we’ve got to be more physical and we have to take it as a challenge,” Simmons said. "You don’t want to come out on the floor and have guys go at you every game. You want to make that a pride thing.